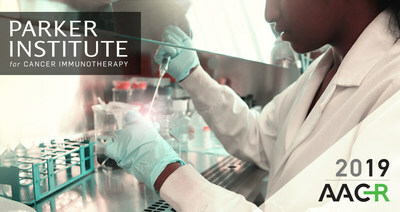 SAN FRANCISCO, March 20, 2019 /PRNewswire/ -- Just months after the first Nobel Prize for cancer immunotherapy was awarded, Parker Institute for Cancer Immunotherapy (PICI) scientists will present the latest research driving the next generation of immune therapies at the 2019 American Association for Cancer Research (AACR) Annual Meeting. The conference takes place March 29 through April 3 at the Georgia World Congress Center (GWCC) in Atlanta. This year's event will be an opportunity to see results from PICI staff scientists collaborating with top investigators at our partner institutions. Our multi-center clinical trial in metastatic pancreatic cancer shows promising early results for immunotherapy combined with standard-of-care chemotherapy. PICI researchers will also share the latest data on how a cancer patient's diet and supplements, including probiotics, can affect immunotherapy response. PICI CEO and President Jeffrey Bluestone, Ph.D., will also be awarded with one of the meeting's highest individual honors. The Parker Institute is an unprecedented collaboration between the country's leading immunologists and cancer centers. The program started by providing institutional support to six academic centers, including Memorial Sloan Kettering Cancer Center, Stanford Medicine, the University of California, Los Angeles, the University of California, San Francisco, the University of Pennsylvania and The University of Texas MD Anderson Cancer Center. The institute also provides programmatic support for top immunotherapy investigators, including a group of researchers at Dana-Farber Cancer Institute, Robert Schreiber, PhD, of Washington University School of Medicine in St. Louis, Nina Bhardwaj, MD, PhD, of the Icahn School of Medicine at Mount Sinai, Philip Greenberg, MD, of the Fred Hutchinson Cancer Research Center, and Stephen Forman, MD, of City of Hope. The Parker Institute network also includes more than 40 industry and nonprofit partners, more than 60 labs and more than 170 of the nation's top researchers focused on treating the deadliest cancers. The goal is to accelerate the development of breakthrough immune therapies capable of turning most cancers into curable diseases. The institute was created through a $250 million grant from The Parker Foundation.